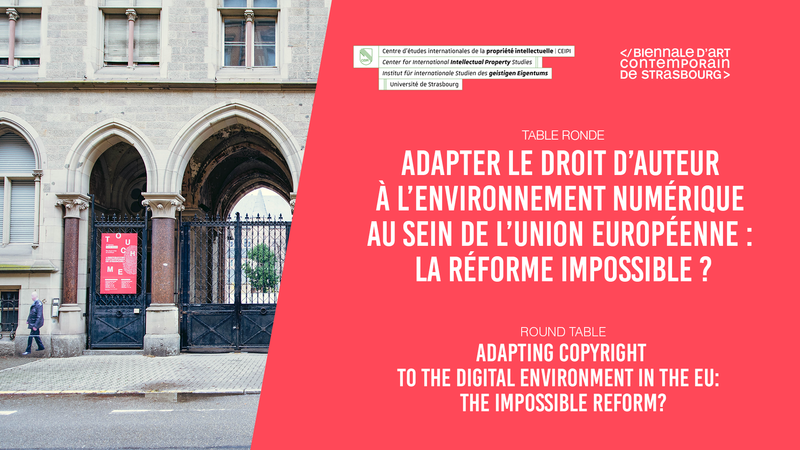 Roundtable: Adapting Copyright to the Digital Environment in the EU: the impossible reform? The round table will be chaired by Christophe Geiger, Professor at the University of Strasbourg, Director General of CEIPI and Director of the CEIPI Research Laboratory. The language of the round table will be (primarily) English. Yasmina Khouaidjia, Commissioner of the Strasbourg Biennale of Contemporary Art and Christophe Geiger, Professor at the University of Strasbourg, Director General of CEIPI. Florian Mehnert, Artist and exhibitor at the Strasbourg Biennale of Contemporary Art. Julia Reda, Member of the European Parliament. The path towards adapting copyright law to the digital environment within the European Union has been anything but smooth. Following many twists and turns in the legislative process, a proposal for a directive to modernize a legislative framework that is dating from the early 2000s is currently in its final phase of “trilogue” negotiations between the European Commission, the European Parliament and the Council of the European Union. Discussions scheduled for the end of January were cancelled at the last minute, due to the text of the directive being the subject of controversy, notably as regards provisions relating to the role of intermediaries in the battle against illegal content, the creation of a new neighboring right for the benefit of online newspaper publishers and the scope of a new exception that permits data mining in the digital environment, without which many innovative activities such as artificial intelligence would be rendered impossible. The Center for International Intellectual Property Studies (CEIPI) of the University of Strasbourg has closely followed these developments for many years and has accompanied the work of the European legislator through numerous studies and legal opinions. This year, the 1st Strasbourg Biennale of Contemporary Art dedicates itself to exploring the nature of the responsibilities, rights and freedoms of citizens in the digital world. The CEIPI is proud to be associated with the Strasbourg Biennale of Contemporary Art in organizing a round table that brings together artists, European parliamentarians, policy advisors and academics in order to discuss the future of copyright law in the online world.